Ok, I’ll explain a bit first. I have an xmas tradition. Usually, on xmas day, my family goes over to an old friend’s house for xmas day dinner and afterwards, games of trivial pursuits and monopoly follow. The kids (that’s me btw) are now 21, 21, 23 and 24 years old respectively so monopoly generally involves alcohol these days too. However, since my family had grandma over this xmas, we didn’t do the traditional lunch at theirs thing, instead, we did the monopoly tradition later on that evening. 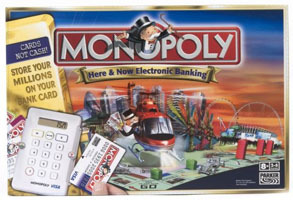 This xmas, James had received a new version of monopoly, with electronic banking. Great idea you’d think. No. God no. Worst. Idea. Ever. FACT. The problem is not the game, I like the updated pieces, the new hotels and flats, the updated chance and community chest cards (“you have been convicted of identity theft, move directly to jail”), i didn’t even mind the prices (10,000x the originals but in the same ratio), but the card reader just killed the game. Everyone gets a card instead of paper money and there is only 1 card reader. Suddenly there’s no more looking at your money in front of you and at everyone else’s to see who to try and break next. To do that you have to put your card in a machine and ask it! It’d be ok if these were swipe cards but they’re not, stick them in this horrid fiddly slot and the machine is so slow you’d expect it to crash at any moment!. The card reader kills the flow of the game and slows it down so much that by the end we decided to call it a draw just to end the agony. Next year we’re going back to paper. 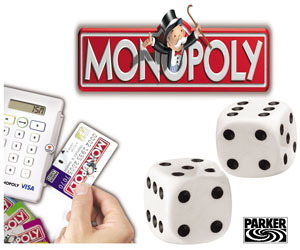 Monopoly: nice idea, bad implementation. Currently Watching: one of the 4 films he got at the HMV sales. Fight Club (SE), King Kong (SE), School of Rock and Orange County. Total price: £15.30! Cha-ching! This was written on December 27th, 2006 . You can leave a response below.